Meh Shirt- Lots of great looking Meh Shirt styles here! Meh Shirt tells it like it is. Q: Do you feel like going to the park for some sun and fresh air? 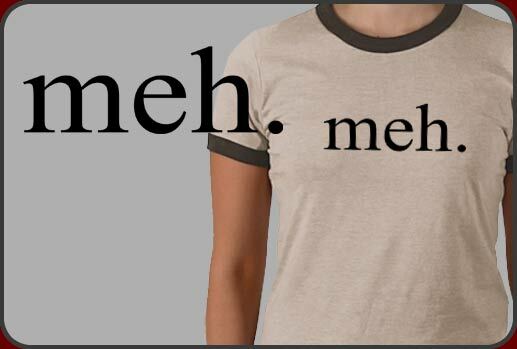 Our Meh Shirt is the perfect way to tell someone you don't really care. Wearing our Meh shirt is said to have almost magical powers that keep others from asking you unwanted questions. Meh is the universal, non-committal answer to any question you don’t have an answer to, don’t care to answer or don’t care to make a decision about. It’s commonly used in geekspeak as geeks tend to be disinterested in anything that doesn’t pertain to what’s happening on the monitor screen. Q: "Do you want to get outside a little today to work off some of that lard gathering around your neck? A: meh. Q: The building is on fire, everyone is evacuating, don’t you think we should get the heck out of here? A:meh. See, it works in the best of situations! Our Meh Shirt is available for men women and children too with lots of hot styles and colors to choose from. Check out our cute meh baby doll tees and comfy all cotton mens shirts too. Oh! And there's also great meh designs available on mugs and fun stickers and buttons as well!